After 148 years in business, you might expect VCNB to have a few longtime customers. But would you expect to see one family bank with us since the year we opened our doors? That’s the case with Laura McGlaughlin’s family. Laura recently turned 95 years young and has a host of stories about local history, our bank and the family farm. 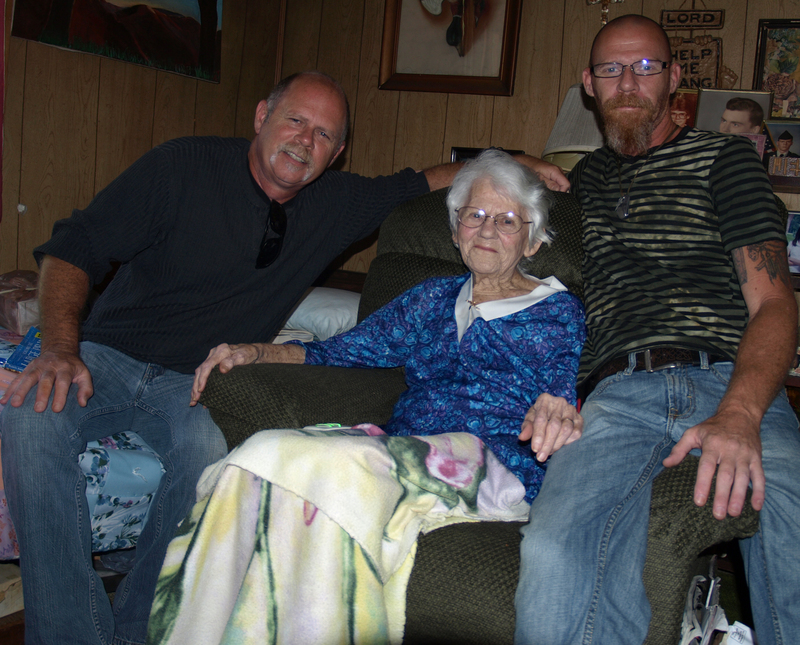 Laura McGlaughlin is pictured with her grandsons Devry McGlaughlin and Scott McGlaughlin. The family has banked with Vinton County National Bank since the bank opened in 1867. The first McGlaughlin to come to Vinton County settled on forty acres while the Civil War was still raging in other parts of the country. Andrew Jackson McGlaughlin found forested land near Zaleski, constructed a log cabin and began a new life in 1863. When Daniel Will opened the doors of the Vinton County National Bank in 1867, McGlaughlin was among our first customers – and the family has been loyal to VCNB ever since. Over those 77 years, she has witnessed much of the area’s rich history and has recorded many stories in notebooks – handwritten stories in a stack of notebooks that her grandson Devry called a “treasure trove.” There are numerous tales that remain unwritten, including that of one McGlaughlin ancestor who was an aide to General George Washington. VCNB Retail Banking Officer Tom Oyer and Retail Accounts Officer Brenda Brooks visited Laura McGlaughlin in her home this summer. McGlaughlin brothers Devry and Scott hold up a local paper from the sixties, one of many pieces of local memorabilia saved over the years. A VCNB ad promoting loans for home appliances. She has a number of her own stories. The sweet natured woman was a popular Sunday School teacher for fifty years. She learned to drive in 1984, proving to everyone that 64 is still a good age to learn a new skill. Laura is the type of lady who knows everyone in the community and who everyone knows and loves. Generations of the Will family have remained hands-on at the bank and Laura remembers doing businesses with many of them. She specifically remembers Bob Will, Sr. and his son Bob Will, Jr. We were thrilled to stop in for a visit at her home this summer so Laura could meet the next generation of Wills involved in the bank. Retail Banking Officer Tom Oyer is the grandson of Bob Will, Jr. and he enjoyed meeting this customer who could share some stories about his family. Today the farm is 450 acres and her grandsons Scott and Devry help her care for the property and are even helping her look to the future. She is the Secretary for their new business Lookout Ridge Resources. They are working to obtain tree farm certification for the first time in more than thirty years and hope to bring back the farm’s once successful apple orchard. Like most doting grandmothers, she makes no attempt to hide her affection for her grandsons. “I’m proud of them. They take good care of me,” she said of Scott and Devry. The pair are also enamored with farm and area history, happily sharing newspaper clippings and other documents from Vinton County history and even giving a guided walk to see an old one-room school house and a magnificent ridgetop view of Vinton County. “It’s beautiful and peaceful up here,” Laura said. Retail Accounts Officer Brenda Brooks has been serving Laura and her family since she came to work at the bank 36 years ago. “Laura is such a sweetheart. She’s been my customer for years and years and I just love her,” Brooks said. “And now I get to work with her grandsons! Imagine having that many generations of one family bank with you,” she said. Through the last 148 years the McGlaughlins have remained loyal customers, seeing the bank through three different centuries, economic change and several wars. As the bank has grown from one office to seventeen and as modern advancements have replaced pen and paper with typewriters and typewriters with computers, the McGlaughlin family has been with us for the entire journey. Banking has changed much over the years since Daniel Will hung out his shingle in McArthur in 1867 but as a community bank, some things never change. We love our communities and value the people in them. Knowing our customers and being their bankers for not just a lifetime but for generations is what it’s all about. We thank Laura McGlaughlin, her grandsons and all those who came before them for banking with us then and now. Here’s to another 148 great years!